I made a prediction a couple of months ago that the next SHIELD release we’d see would be an upgrade to the original – but with a dose of Tegra K1. As it turns out, I was wrong. 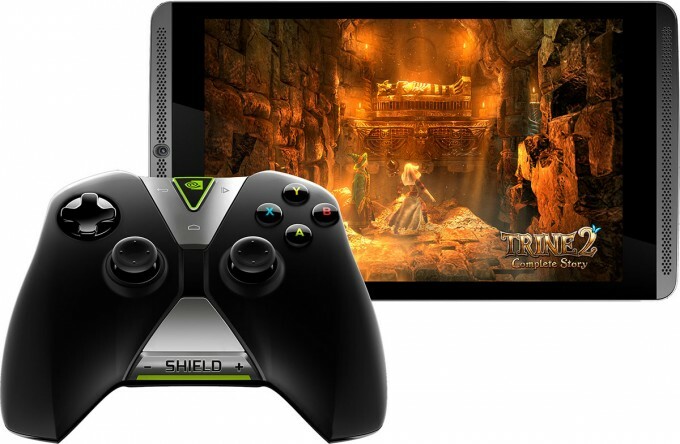 However, like the SHIELD portable, NVIDIA’s just-announced SHIELD Tablet and Controller are two products that portable gaming fans should get excited about. When NVIDIA announced its SHIELD portable last summer, it took no time at all to figure out what the most-requested feature from consumers was: “Please let the tablet be detachable!” Of course, as the device was explored further, it became obvious that NVIDIA couldn’t have designed the SHIELD with that characteristic; the display would have become too bulky, and the innards of the gamepad would have gone underutilized. Both would be poor choices for a portable device. Despite that being the case, though, NVIDIA didn’t just turn a blind eye to that idea. 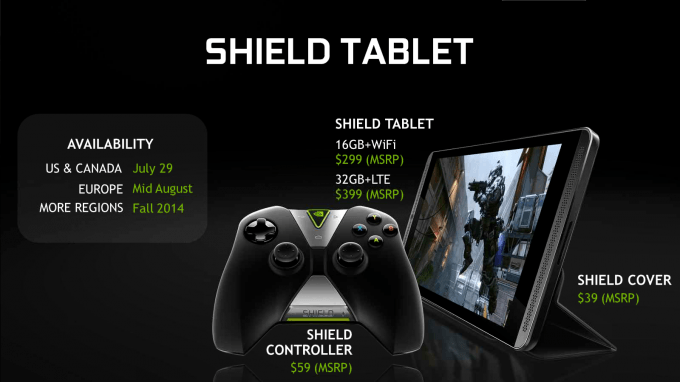 Today’s reveal of the SHIELD Tablet and SHIELD Controller is proof of that. As with its SHIELD portable, NVIDIA didn’t want to add another device to the market just for the sake of it. It wanted to differentiate itself – and as we discovered in our in-depth review, it certainly had. SHIELD Tablet is what NVIDIA calls the ‘Ultimate Gaming Tablet’, but it’s also designed to be a great all-around entertainment device in general – like the portable. Let’s dig deeper. 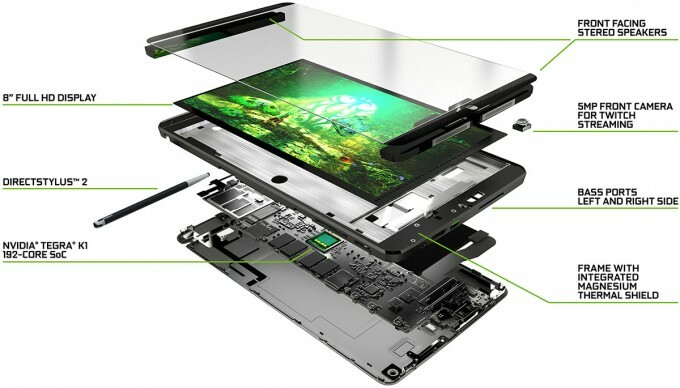 The tablet itself comes in at 8 inches, which makes it a tad larger than the popular EVGA Tegra Note 7 and Nexus 7. 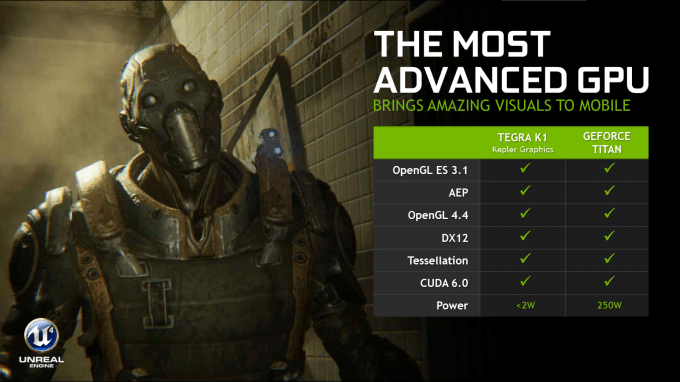 What really separates it from those is what’s under the hood: A Tegra K1 processor. We took an in-depth look at K1 in January, so if you’re unfamiliar with what it brings to the table(t), I highly recommend reading that through. SHIELD Tablet includes NVIDIA’s much-touted DirectStylus 2 technology, and of course the stylus itself. The big differences between the first and second-gen DirectStylus is that the new version allows for GPU-accelerated drawing. One example of that is with a, “new capability where pigment and paint mix and bleed physically, in real time, and the palette is naturally illuminated in 3D as the user adjusts the light source.” Further, the pen is now twice as responsive. I mentioned the Tegra Note 7 before, so I might as well tackle this now: SHIELD Tablet does not replace the TN7. The TN7 at this point is still what I’d consider to be the most attractive 7-inch tablet out there, and at $199, it’s $100 less than the Wi-Fi version of the SHIELD Tablet. For that $100, you’ll gain an inch in size, a much higher resolution, and of course, the significantly faster Tegra K1 processor. Those who were a little miffed at the lacking of an LTE option on the Tegra Note 7 side might be pleased to know that NVIDIA’s SHIELD Tablet doesn’t suffer the same fate. That model retails for $399, and doubles the storage capacity to 32GB. A summary of the hardware specs: Tegra K1 quad-core SoC clocked at 2.2GHz, 2GB of RAM, Wi-Fi+LTE (micro-SIM) or Wi-Fi only (Wi-Fi is 802.11 a/b/g/n MIMO), Bluetooth 4.0 LE, GPS, 9-axis g-sensor/gyro/compass, 8-inch IPS display with a 1920×1200 resolution, front-facing speakers, microSD slot (up to 128GB), a front 5 megapixel camera, a back 5 megapixel auto focus camera, a mini HDMI 1.4a port, a micro-USB 2.0 port, a 3.5mm headphone jack (can utilize microphone), and a 19.75Wh battery supporting up to 10 hours of HD playback. 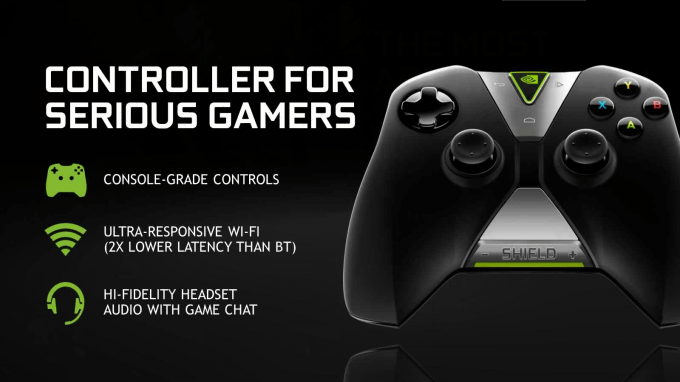 We’re at the ninth paragraph now, so I guess it’s time to mention the SHIELD Controller. This stand-alone gamepad will retail for $59, and shares many similarities with the gamepad built into the SHIELD portable. Rather than connect to the SHIELD Tablet via Bluetooth, like most other wireless gamepads out there, NVIDIA’s opted to use Wi-Fi, as it cuts the latency in half, versus Bluetooth, and boosts bandwidth eightfold. If you don’t want to pick up a SHIELD Controller, or already own a Bluetooth gamepad, you’ll be able to use it with the SHIELD Tablet without issue – as long as the gamepad is suited for Android, of course. It’s hard to gauge from a picture just how comfortable this gamepad is in relation to other established ones, or the one built into the SHIELD portable, but I like what I see. It appears that at the front, below the analog sticks, is a battery meter, and while it might not be too obvious, the NVIDIA logo at the top is a Home button. I’m sure this will behave like any Home button on an Android device, but this one has a secret perk: Hold it down, and speak what you want to do. Examples are, “Watch Iron Man“, “Listen to U2 Desire“, “Who’s the best-looking person on NVIDIA’s PR team?“, and so forth. 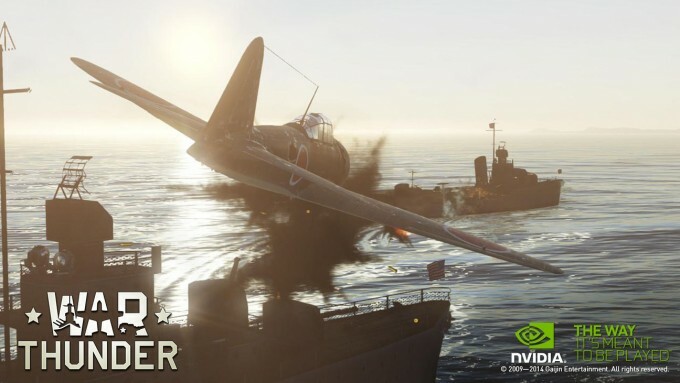 At this time, the SHIELD Controller will not work on a PC, but it could in time, if NVIDIA wanted to tie it into its GeForce Experience package, or simply release a driver for it. I’m not a betting man, but I’m still going to bet that one of those things will happen. 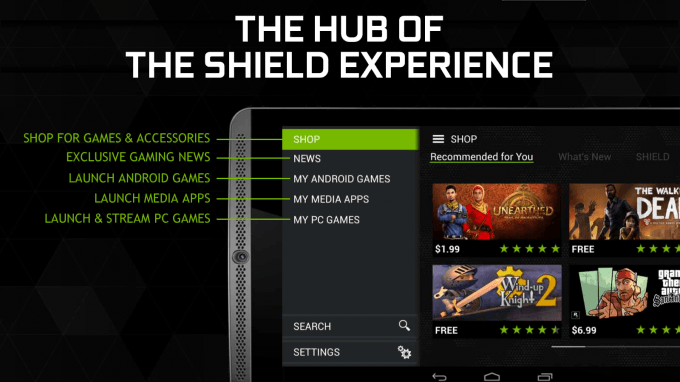 With the release of SHIELD Tablet, NVIDIA’s going to replace its ‘Tegra Zone’ app on SHIELD devices (yes – that includes the portable) with ‘SHIELD Hub’. Overall, the mechanics and goals are the same, although SHIELD Hub adds some functionality, such as being able to access media apps without leaving its UI. From this single app, you’ll be able to shop for games, read news, stream games from your GeForce PC, and as mentioned, get quick access to popular media apps, such as Netflix, Hulu, and Twitch. 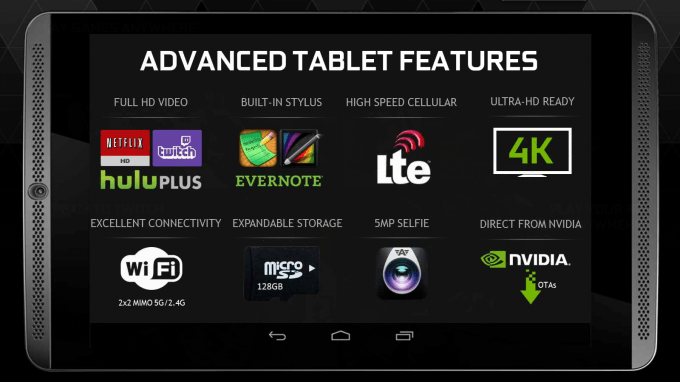 A lot of devices support Twitch, but NVIDIA’s taken things a step further with the SHIELD Tablet: It can stream to the service. That’s right – want to beam your session of Dead Trigger 2 or Angry Birds to the world? You’ll be able to. Being able to stream games online impresses few people nowadays, but it’s very impressive to see it being possible on a mobile device. Because the SHIELD Tablet includes a stylus, it’s not surprising to see that some special software is included – but, it is a little surprising to see that it’s not the same software seen on the Tegra Note 7. With the GPU-accelerated ‘NVIDIA Dabbler’, you’ll be able to create ‘hyper-realistic’ images with the help of the DirectStylus 2 pen. Or, if you have artistic skills on par with mine, you’ll simply draw circles over and over, just because you can. So what about the games? In the time between the SHIELD portable launch and now, NVIDIA’s said that the catalog of games that SHIELD specifically supports has tripled, and now sits at around 400. Two of those were rather notable, Half-Life 2, and Portal – the latter of which I played straight through on the SHIELD. As you’d expect, the SHIELD Tablet can play all of those games just fine, but NVIDIA’s dropped some hints (and screenshots) to show what we can expect soon. 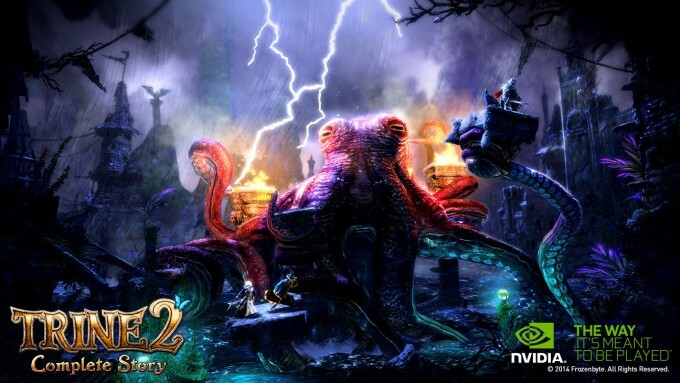 At GTC this past spring, company CEO Jen-Hsun Huang showed-off Frozenbyte’s Trine 2 running on Tegra K1. It’s almost of no surprise, then, to learn that NVIDIA is going to be bundling a copy of that game on every single SHIELD Tablet. If you enjoy platformers with lots of eye candy, you can’t go wrong with this game. 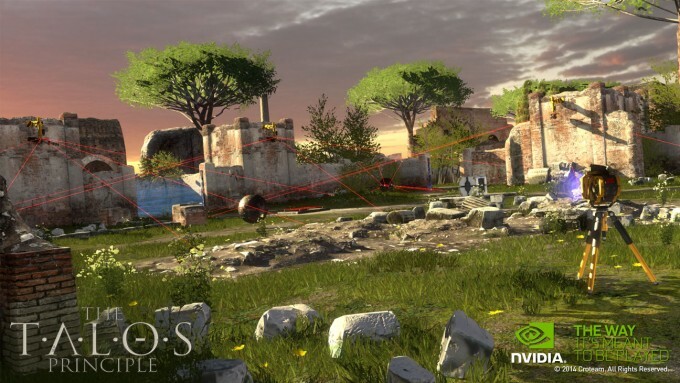 In addition to that, the first-person puzzle game Talos Principle, along with popular World War II fighter War Thunder, will be coming to the Google Play store this fall. Now would be a good time to mention that the SHIELD Tablet will be able to support up to 4 SHIELD Controllers, so if you want to plug the tablet in via HDMI to a TV, there are some definite multi-player possibilities there. One thing to remember is, if the SHIELD portable can do it, so too can the SHIELD Tablet + Controller combo. I took a look at SHIELD’s major software features in my look at the device last fall. The following slide highlights the bulk of what makes the SHIELD Tablet special: It supports LTE wireless, 4K output, over-the-air updates direct from NVIDIA, expandable storage up to 128GB, a built-in stylus, rich media support, and includes not one, but two (front and back) 5 megapixel selfies. Err – I think that means “camera”? What does SHIELD Tablet mean for the SHIELD portable? Not a thing; it’s an expansion of the SHIELD line, rather than a replacement. NVIDIA considers the portable to remain a “critical” piece of the product line, and it will continue to be supported. While there was no outright confirmation that we’d be seeing a sequel of sorts, the presenter’s wording led me to believe that NVIDIA’s first AIO portable will not be its last. On the topic of availability, all three components (including the SHIELD Cover, priced at $39), will be available in the US and Canada on July 29th. Europe, which got the shaft when it came to the SHIELD portable (understandably, I suppose – NVIDIA was diving in head-first where releasing its own direct product was concerned), will see availability in mid-August. Finally, we’ll see support for other regions pop up this fall. Overall, I’d say that this is an impressive showing by NVIDIA, and as a big fan of the SHIELD portable, this launch gives me big relief that the series didn’t become a one-off sort of deal. I look forward to seeing the SHIELD Tablet in action.